Private schools take justifiable pride in their students' SAT scores -- it's something they work at. If you’re the parent of a school age child, even a very young one, you’re probably already thinking about the fall that’s coming far too soon, when your heart will soar with pride, and your bank account will chart new depths: College. The trick, of course, is getting your kid into the school he or she wants. Students, parents and teachers report increasing pressure to find that slot, as more freshmen than ever crowd ivied halls — most with the hope of using HOPE scholarships to pay the way. Grade-point averages accrue slowly, so while report cards are still as tension-fraught as ever, perhaps not even the prom date dilemma produces as much anxiety as the dreaded SATs and ACTs — final exams for an entire 12 years of schooling. Of course, tests are only a part of what gets a student into college. Admissions counselors look at a student’s total portrait, including his or her essay, recommendations, extracurricular and community involvement, as well as family income and other demographics — depending on the school. Missy Sanchez, director of college counseling at Woodward Academy in College Park, says Woodward invites parents and students to a mock application process along with a real college admissions professional. “It creates a dialogue,” she says, and that often opens students’ eyes to the fact that admission may be based on much more than just test scores. Still, a student armed with high test scores can walk into the high stakes admissions game feeling flush. Teachers and parents agree: With more students trying to get into the best schools, students impose more pressure on themselves for high test scores than ever before. With many of Georgia’s private schools boasting 90 to 100 percent college admission rates, how do they prepare their students for those crucial tests? The state’s private schools have the budget and staff to provide a full array of resources to their students, so it’s not surprising that the Georgia Independent Schools Association (GISA) reports higher SAT averages than the state’s. For the 2004-05 year, the average for the state as a whole, including private schools, was 993, compared to 1124 for GISA members only. The national average SAT score for the same period was 1028. With annual private school tuitions of $15,000 or more for high schoolers (and twice that for boarding school), it’s not surprising that these schools’ students would produce higher results. In fact, you might also expect an emphasis on high-tech, specialized training for taking the tests, with flanks of hired coaches and inside tips on strategy that help achieve those goals. The answer? Practice, practice, practice. Sam Moss, dean of college guidance at the Darlington School in Rome, says, “most students would benefit” from some form of trial run. At Darlington, like many in the Atlanta Area Association of Independent Schools, students may take some form of the test three times, or more: the PSATs, as freshmen, again as sophomores; and when they take the SATs as juniors, their scores are entered for National Merit Scholarships. “The schools pay for it,” he says. “We think it’s that important.” He notes that sophomores receive corrected versions of the tests they took as frosh, so that “as 10th graders, they can go back and figure out what they did wrong,” he says. “We think that really helps students.” And of course, many students end up taking the SATs several times, as colleges typically accept the best scores. Public schoolteachers probably would agree with those strategies — and point to a recent U.S. Department of Education study showing that once income, race, ethnicity and parents’ educational background are taken into account, comparable fourth- and eighth-grade public school students test as well as or better than as their counterparts in private schools. Mary Beth Fry, director of college counseling at Savannah Country Day, says, “It’s about your learning style. In theory, [online practice tests] are a good thing. But if the student is the type who has trouble focusing, who’s constantly toggling back and forth between windows, with one open to instant messaging and the other downloading music, it can be a problem.” That student, she says, might be better off with a little private tutoring if he or she needs extra help. Although Woodward emphasizes the student’s role in the application process, Sanchez says she is one of three full-time college counselors for a class of 300, without teaching or other responsibilities, focused solely on guiding students into colleges. “Our fall is spent in 14-hour days, getting applications in,” she says. “I don’t know how public school counselors do it.” Like many of the private schools in this story, Woodward boasts a 100 percent college admission rate for its graduates. Most private schools provide access to some sort of low-cost tutoring, usually for $100 to $200 or an SAT preparatory course (often four or eight weeks, sometimes on weekends or evenings), and some invite representatives from outside agencies such as Kaplan or Princeton to provide students the opportunity to take courses specifically designed for the SATs. Jacque Digieso is co-founder and headmaster at The Cottage School in Roswell, which grew from her teaching experiences with special-needs students. 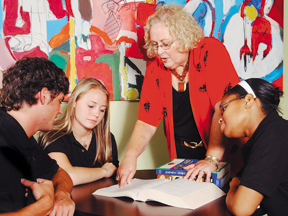 The Cottage School specializes in educating students diagnosed with attention deficit disorder and other mild learning disabilities. The focus is leading the student toward a career, usually involving post-secondary education — which can include culinary school or an architecture degree, depending on interests and skills. “Most kids come to us trying to get through high school,” she says. “About 80 to 85 percent go to college,” with others going on to other post-secondary training. The Cottage School philosophy affords intense individual attention until a student masters a stumbling block — and experiences success. “It’s not manufactured success,” she says. “It’s real.” Then students match their strengths with potential careers. Last year, alums who visited the school to tell students about their work included a pilot, an artist — and a college admissions counselor. Still, with the emphasis on internships and real-world training, The Cottage School weaves the college application process into classwork. The SAT essays are English class assignments. “The entire application process is supported by the teaching team,” she says. “It’s very labor intensive, but when the school is not a successful venue for learning, the school must make a change. It’s sometimes hard,” she says, “for a school to focus in and hold the student accountable. We don’t always assume that everything is going to be OK.” The Cottage School’s SAT prep class includes relaxation and visualization techniques. Students with ADD and other medically diagnosed disabilities enter college under different guidelines, notes Digieso. The Americans With Disabilities Act requires any educational institution that receives federal funding to “mainstream” such students, allowing leeway according to the disability. A student’s application must include the medical diagnosis, and how the secondary education adapted its classes for the student, she notes. “The SATs impact our curriculum a lot less than AP courses,” he says. Wilson also notes a disproportionate emphasis on the form — rather than the substance — of learning. “I’m reluctant to talk about SAT scores as an end-all and be-all,” he says. At Brookstone, he says, the emphasis is on fundamentals: reading, and, especially, writing. While he’s pleased to note that the new SATs this year introduce a writing component “because we feel that is a strength of our school,” at Brookstone, vocabulary building is “a matter of course,” rather than SAT prep. “We really emphasize reading for pleasure,” he says. This year, author and historian David McCullough will visit his campus. “The entire school is reading 1776.” Among the high-tech learning tools they will employ: A highlighter (for words they don’t know) and a dictionary. He notes that since the nation has “become so preoccupied with test scores, those scores have gone down. Our SATs are annually very high, but maybe everybody needs to go back to fundamentals.